The Upheaval Dome trail is located in the Island in the Sky district of Canyonlands National Park west of Moab, Utah. Canyonlands National Park is about 120 miles from Grand Junction, Colorado and 32 miles from Moab, Utah. The Upheaval Dome trail is also sometimes referred to as the Crater View trail. 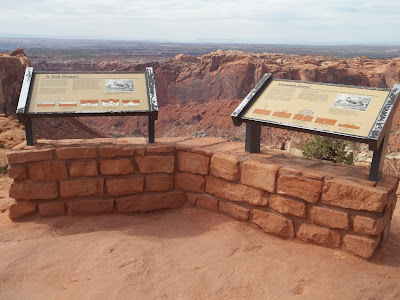 You will see why when you reach the first overlook where there are two kiosks describing the different scientific possibilities for the creation of this geological oddity. 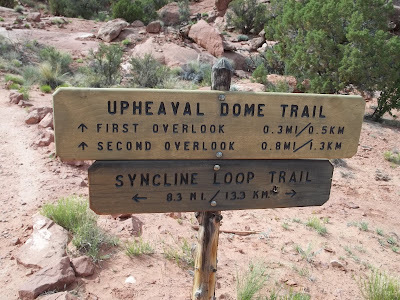 The Upheaval Dome and Syncline Loop trails share the same trailhead. 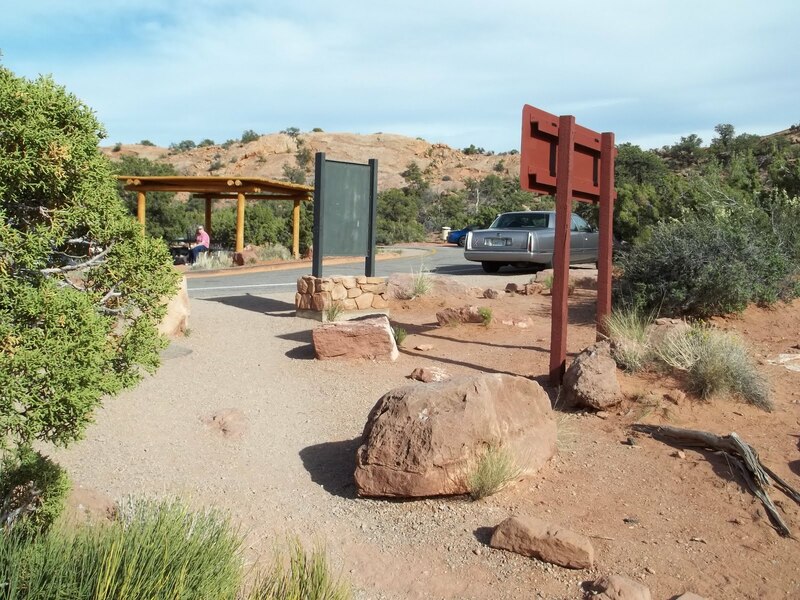 Parking at the trailhead can become very congested after about 11 AM but you can usually find a spot along the road at the exit. A good many visitors only go as far as the first overlook so parking spots usually free up fairly quickly. The Upheaval Dome trail is intersected by the Syncline Loop about a quarter mile from the trailhead. There are warning signs a short distance in both directions on the Syncline Loop trail just in case someone was to get confused and take the wrong turn. 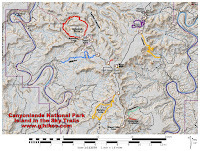 The Syncline Loop trail is a much longer and very difficult hike. The Upheaval Dome trail is very easy to follow. Trail improvements in the areas susceptible to the most erosion include steps forming staircases and rocks and tree branches placed along the sides of the trail to keep hikers from widening the path in these areas. 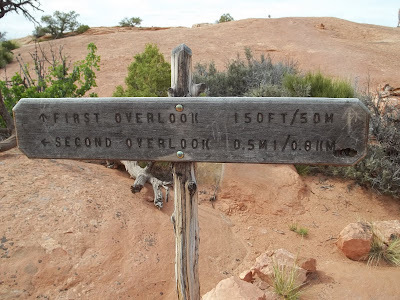 The trail leading up to the first overlook is only about a quarter mile long but due to its steepness it is of moderate difficulty. 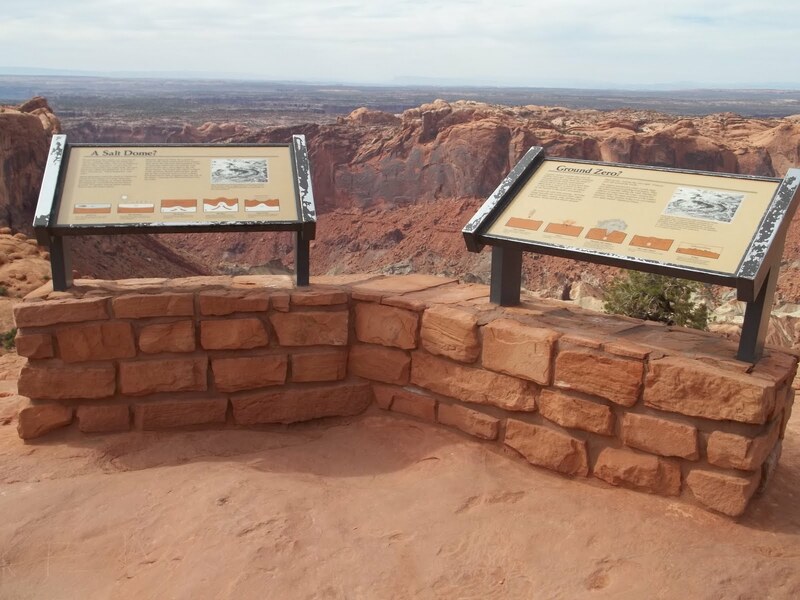 There are two kiosks at the first overlook that describe the two different scientific possibilities for the creation of this geological structure. The traditional view was that what you are looking at was created by an upheaval called a salt dome. Salt domes are very common at other sites in the area. 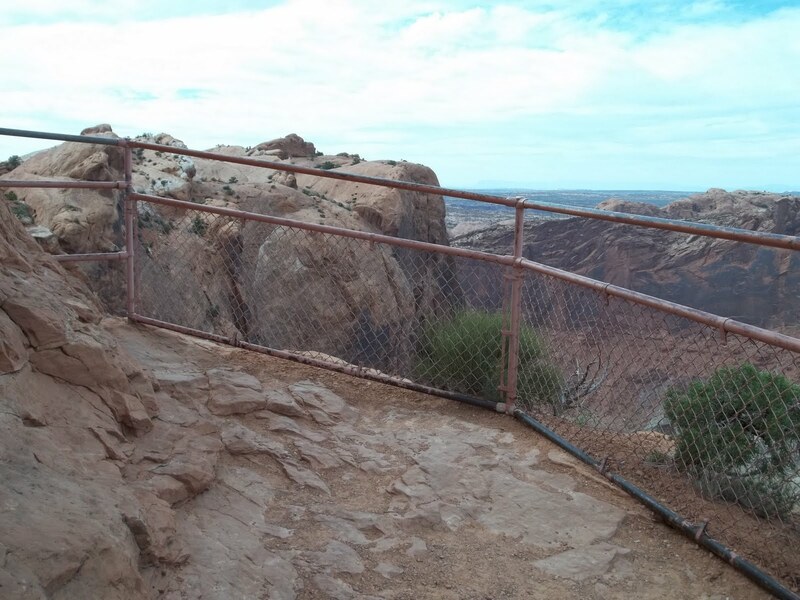 The more recent contrasting opinion is that the structure was created by a meteorite impact millions of years ago. 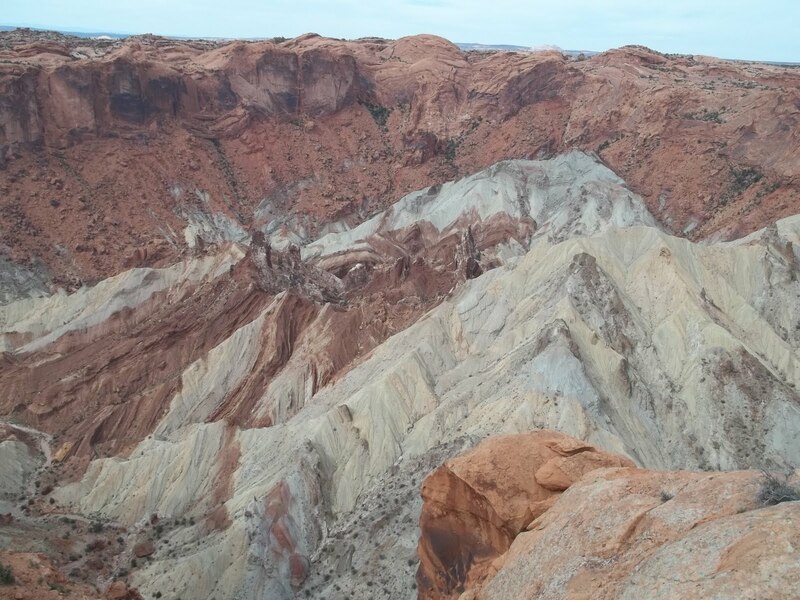 Recent discoveries of shocked quartz, which can only occur from the pressures exerted by an impact, along with seismological studies confirm the impact theory. The trail to the second overlook will add a total distance of 1 mile to your hike. 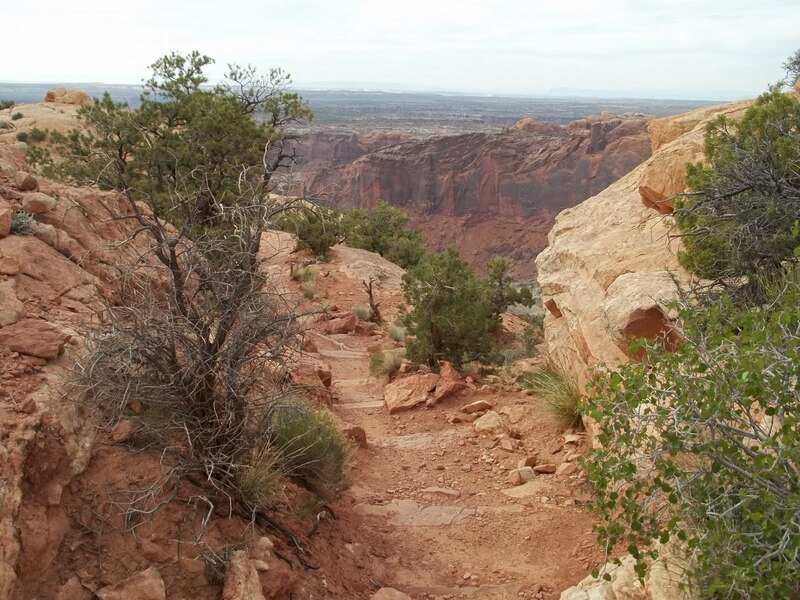 Besides getting to see different views of the crater the trail to the second overlooks allows you to experience more of the high desert environment of the Island in the Sky District. 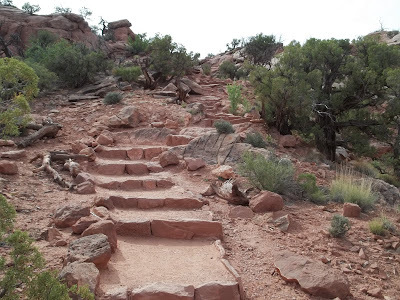 The trail has a few scrambles but for the most part it is fun and easy to follow. 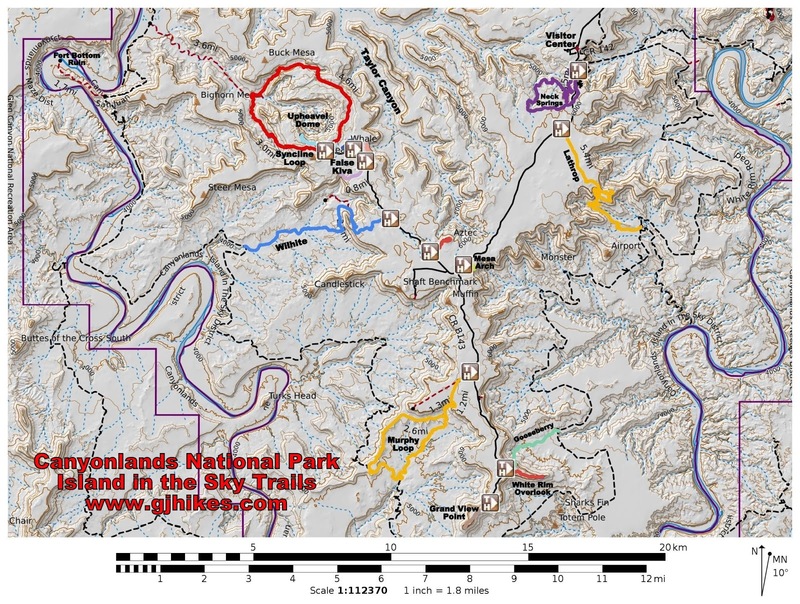 There is a short hillside that is relatively steep that almost doubles the overall elevation gain of the hike. A fenced overlook on the side of the sheer cliff is the traditional turning around point of the hike. 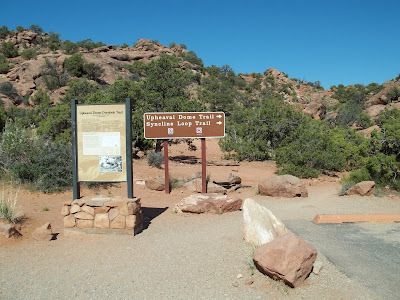 Since this area is pretty much all slickrock you can wonder around and do some exploring, maybe venture a little further out on the point of rock, without worrying about damaging the environment. 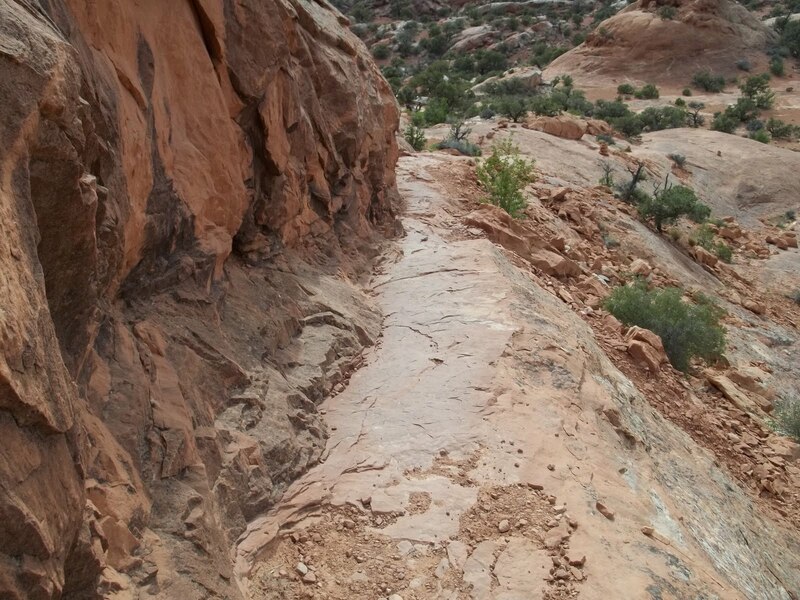 Pictures of Upheaval Dome from the International Space Station look like an impact crater on some alien world. It is hard to appreciate that aspect of the crater from this close distance but if you look close you will see pinnacles and other structures that aren't discernible from space. 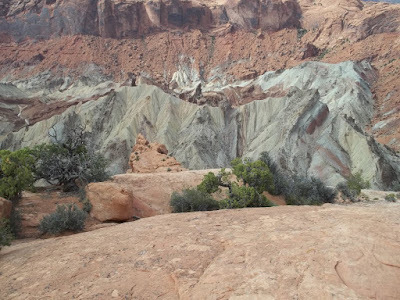 The Upheaval Dome trail is a nice short hike that provides a great opportunity to see an anomalous geological structure no matter what you think may have caused it. I personally feel that Upheaval Dome is one of the four must see sites in the Island in the Sky district along with Mesa Arch, Grand View Point and Aztec Butte. If you would like to see it for yourself then all you have to do is 'Take a hike'.